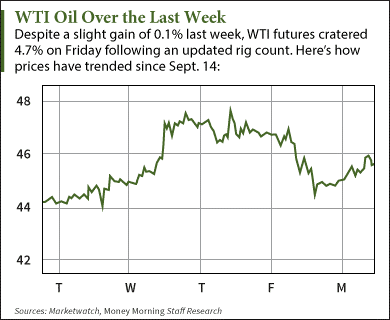 WTI crude oil prices today (Monday) bounced back after enduring their largest one-day drop in three weeks on Friday. At 9:45 a.m., WTI crude oil prices were up 2.6% to $45.86 a barrel. During the previous session, the U.S. benchmark tumbled 4.7% despite Baker Hughes Inc. (NYSE: BHI) reporting the U.S. rig count fell by eight to 644. Oil's decline was attributed to the Fed's decision to keep interest rates near zero – a move which sent the broader market lower on Friday. Brent crude oil prices today saw smaller gains than its American counterpart. The international benchmark ticked up 1.7% to $49.06 a barrel. It has fallen 12.1% in September. The rise in crude oil prices today comes on traders' expectations that the yearlong price crash will incentivize producers to decrease output. According to the U.S. Energy Information Administration's (EIA) latest estimates, output has fallen from a peak of 9.6 million barrels a day in April to 9.1 million in August. It projects production to hit 8.6 million a day in mid-2016. "The incipient decline of production in the U.S. in particular will herald in a long-term and fundamental bottoming out process on the oil market," Commerzbank analysts wrote in a report. According to Money Morning Global Energy Strategist Dr. Kent Moors, supply and demand will keep working in tandem to lift oil prices over the long term. Many oil watchdog groups like the International Energy Agency (IEA) are expected to raise their 2015 demand figures soon. "The current forecasts are already high, with the IEA predicting that global oil demand this year will average 94.2 million barrels per day, 1.6 million more than last year," Moors said. "For next year, the IEA is forecasting 95.6 million barrels per day." "The fundamentals paint a picture of tightening oil supply at a time of increasing demand. That will be where the real long-term pricing of oil is going to be determined." Alex McGuire is an associate editor for Money Morning who writes about energy. Follow him on Twitter at @AlexMcGuire92 for all of the biggest oil and gas updates.